The rapid scan DOW will be deployed north of Boulder on top of Table Mountain close to Lefthand Canyon during the first snow storm and south of Boulder close to Eldorado Canyon during the second snow storm. Both locations are approx. 5 km east of the Front Range. The locations are indicated by the red markers. The rapid-scan DOW radar data will be compared to observations from other instruments located at the Mountain Research Station, CU Campus, and Marshall fields (blue markers from west to east). 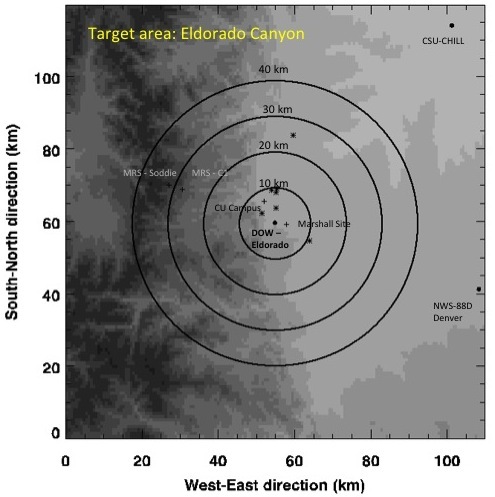 The image to the left shows a topographic map (gray scale) and the location of the instruments (plus symbols: Mountain Research Station, CU Campus, Marshall field; star symbols: surface observation station; filled circles: radar sites of CSU-CHILL radar, NWS-88D radar, and rapid-scan DOW). Range rings every 10 km are centered around the location of the rapid-scan DOW. HIGHresLOW scans will have a range up to 7.5 km, LOWresTALL scans have a maximum range of 30 km. 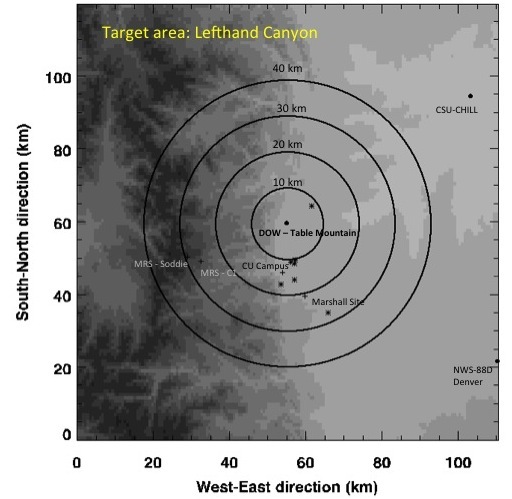 The image to the left shows a topographic map (gray scale) and the location of the instruments (plus symbols: Mountain Research Station, CU Campus, Marshall field; star symbols: surface observation station; filled circles: radar sites of CSU-CHILL radar, NWS-88D radar, and rapid-scan DOW). Range ringes every 10 km are centered around the location of the rapid-scan DOW. HIGHresLOW scans will have a range up to 7.5 km, LOWresTALL scans have a maximum range of 30 km. Besides the rapid-scan DOW radar we will also use instruments in the vicinity of the radar deployments. The instruments and their location are listed and shown below. More information about the instruments can be found in the main menu on top of this page. 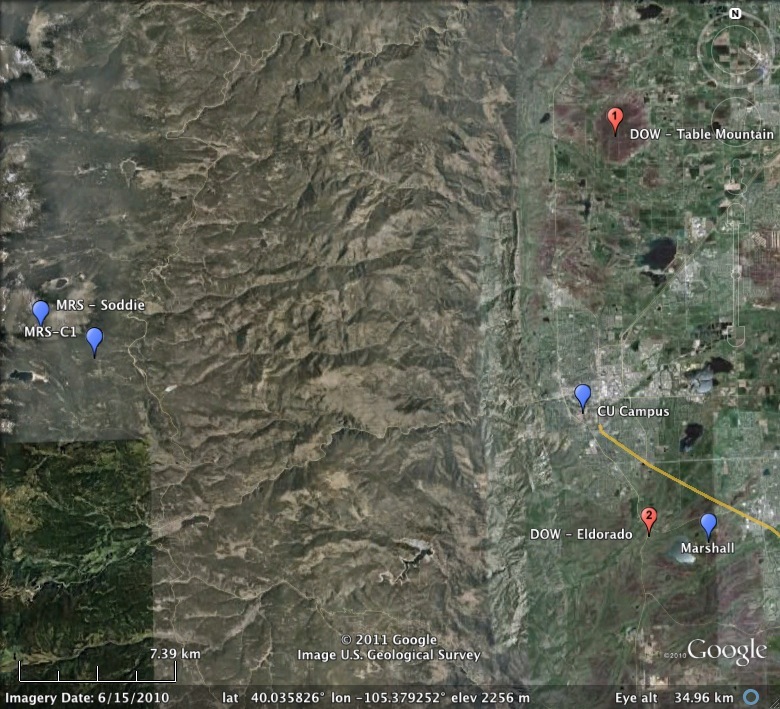 To view current observations from CU campus and the Mountain Research Stattion <<click here >>.